Brenna Kelleher grew up in the mountains of southwest Montana. She started skiing as soon as she could walk and began racing at 5 years old. Developing her career as an outdoor mountain athlete, she continued as an NCAA ski racer for Montana State University and claimed the 2001 Junior World Championship as a freestyle kayaker. Brenna shares her love and knowledge of the outdoors in the Bozeman/Big Sky area; guiding horseback trips in Yellowstone Park and coaching freestyle kayaking. She has traveled to Africa leading a group of high school girls, as an educator in a semester abroad program; teaching math, travel journalism and physical education in the distant outdoors. Brenna is currently a member of the PSIA/AASI National Alpine Team and a ski instructor and guide at Big Sky Resort. 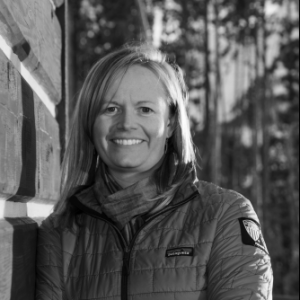 In addition to being a PSIA Examiner and her Wilderness First Responder certifications, her avalanche education and mountain expertise has aided her in leading advanced women’s and youth specific clinics; training big mountain tactics, steep skiing technique, terrain management and practice, use and understanding of avalanche rescue gear.